The Terminus Legion Board is composed of five members. Board Members are elected by TL membership and serve staggered two year terms. The role of the Board is to help oversee the direction and efforts of Terminus Legion for the benefit of its members and Atlanta soccer. The board can be emailed at board@terminuslegion.com. While not the most verbal of members, I’ve volunteered at nearly all of TL’s events since the beginning of the 2017 season. Most of you will recognize me if you’ve ever come by our main table at tailgates. I’m the one helping you to find your way – whether that’s getting you signed up to join, purchasing a t-shirt to show your support, or literal directions to the beer tent – I hope you’ve not gotten lost on my watch (for too long, anyway!). Whether it’s Terminalia, or the next charity poker event, I hope to keep serving TL, and more importantly, the community. I plan to continue in these roles, but would like to add to that the opportunity to serve you in a leadership capacity. As such, I would like to contribute to the overall strategic mission of TL by serving on the Board of Directors. With your support, I hope to continue serving TL in our mission of support, service, and community. Chris is an Army Brat who was born in San Francisco and now lives in Columbus, GA. 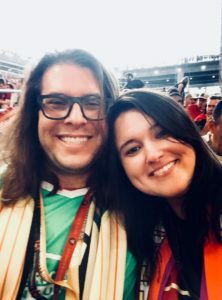 The Chapter element of TL’s structure caught his attention, and he joined Terminus Legion at the inaugural match: From there he started the TL Columbus chapter, helped with tailgate setup/planning, leads the pregame marches, and was elected to the TL Board. If you want to find this guy, all you need to do is head to the front of any pre-game march and look for the green goalkeeper jersey. Austin has been involved in soccer his entire life, from playing to coaching to blogging to podcasting. He moved to Atlanta in the fall of 2014 and started attending Atlanta Silverbacks games. From there he joined Terminus Legion and volunteered at events and helped start the Terminus Legion podcast. He stepped forward in 2017 to serve a term as President of Terminus Legion, overseeing the day to day running of the organization. 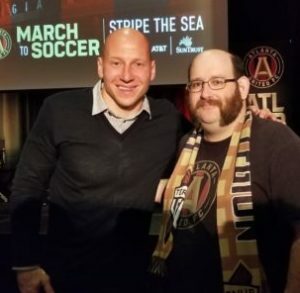 As I lifelong soccer fan and 15-year ATLien, I longed for an Atlanta MLS team for over a decade while playing in adult leagues around the city, meeting others of the same mindset. Furthermore, I did everything in my power to grow the game, whether in my own personal group of friends or to strangers wherever, all in hopes of building the groundswell of support for a successful MLS team (little did I know just how explosive the ATL support was gonna be, but we expected the worst). I have been a Terminus Legion member virtually since inception and creation, and I started volunteering at beer fests, footgolf and other TL events since 2014. 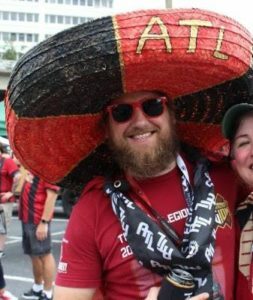 I have been present at every major ATLUTD event, including expansion announcement, name/crest reveal, and jersey announcement and have been captain and a two-year member of the TL soccer team. I have also headed fund-raising efforts for both the SG Tournament and the Black Tie Soccer team, and currently manage sponsor and partner relations for TL. I would like to keep TL moving forward and well organized. I feel like these are the first steps to success and can make things a lot easier. I really love this organization, but feel like we sometimes take a step back looking too far into the past. Reflection is fine, and needed, but it is important to always move forward and focus on improving. I feel like the communication between the board, leadership, and members is key to eliminating confusing decisions, and helps making everyone feel included in the decision making process. I think I would be an asset to the board because I am very organized, have a strong voice, and have always been a “go-getter.” I am a good listener and team player, but not afraid to insert my thoughts on matters. I look forward to bringing in some fresh ideas to make TL the best it can possibly be for our members and the team. Day to day operations are by led by the Terminus Legion Officers. 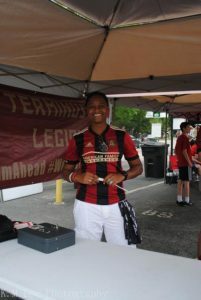 These volunteers make sure that TL members have memorable experiences at every TL event, make sure that TL members get their merchandise, and make sure that TL members are up to date on everything happening with Terminus Legion and Atlanta United. Domer & his now wife, Kacy, moved to Atlanta in 2008. 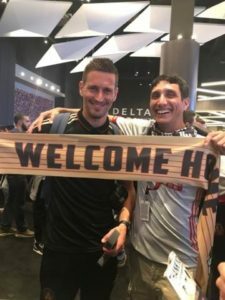 When Domer found out about Atlanta United, his excitement and giddiness were contagious. Season tickets were purchased & soon after, they were members of Terminus Legion where Domer immediately began volunteering for tailgates & getting involved as much as possible. TL is now a lovely extension of the family. If you need to find him at the tailgate or on match day, just look for the grin, hair & Guzan kit. Christina has been in non-profit work since 2005. Currently running the social enterprise of a special needs center, she hosts the fundraisers and private events for the historic establishment. Even Julian Gressel and his bride Casey visited her at the iconic venue for their engagement shoot. 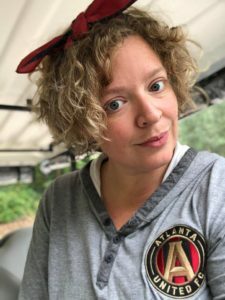 Christina and her son, Elijah, experienced the grander and beauty that is Atlanta United’s culture in 2017. Enchanted by Terminus Legion’s organization and structure, she assisted in getting the 2 Spikes’ tailgate up and running. Christina was also a key negotiator for the chapter union with AU Nation in Gwinnett, creating the most dynamic watch party environment in the metro area. Christina’s bid for leadership landed her in a position to help cultivate a captivating experience for those who are #AllAboard. I grew up in Canton Georgia a suburb in the metro Atlanta area active in sports and music. My mom and dad coached the first soccer team I ever played on while my sister played in high school. I have followed Atlanta sports as long as I can remember. 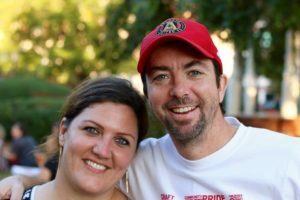 Currently, in addition to being an Atlanta United Supporters, my wife, Heather and I are also season ticket holders for Georgia Tech. You can say I am a lover of both types of football. I am also a liver transplant recipient and thanks to a selfless family and donor I was given the gift of life. My goal is to do all I can to help Terminus Legion support the Kings of the South. Claire grew up a Navy brat traveling around the world and eventually landed in Rome, GA where she attended Berry College. While there she met the love of her life, Bradley Hartloge, and from that point on she was thrown full force into the soccer world. 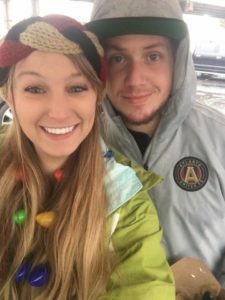 She and Bradley attended a Terminus Legion watch party in Rome to watch Atlanta win against Minnesota United in the snow. From then on, they both have been dedicated Terminus Legion members and avid scarf collectors. Claire fell in love with the crazy atmosphere at games and tailgates; you can find her walking around the tailgate collecting donations or at the check-in tent most home games. Claire hopes to have complete transparency with Terminus Legion finances and wants to ensure there is open and honest communication between leadership and members. She hopes to serve TL to the best of her abilities with the help and support of all Terminus Legion members. The Terminus Legion Directors manage the many facets of TL as we strive to fulfill our values of Support, Service and Community. The Match Day Support Director oversees all aspects of match day support, including tailgates, March to the Match, tifo and supporters section. Email the Matchday Director at matchday@terminuslegion.com. The Events Director oversees all aspects of events, including watch parties, charitable activities, executing special events such as Terminalia and the Member Appreciation Party, and coordinating with volunteers at events. Email the Events Director at events@terminuslegion.com. The Members Director oversees all aspects of memberships, including Terminus Legion merchandise, membership communication, finding, developing and maintaining sponsors, developing and maintaining TL chapters, and overseeing away ticket purchases, distribution and communication. Email the Members Director at members@terminuslegion.com. The Communications Director oversees all aspects of communications, including social media on Terminus Legion platforms, media requests, the TL website, TL graphic design needs, the weekly TL newsletter, and member and Golden Spike announcements for each home match. Email the Communications Director at marketing@terminuslegion.com.